It is not that uncommon to see people still having a landline phone connection. They are still popular but the old corded phones seem to have disappeared. Cordless versions took over due to their convenience and reliability. Most major manufacturers introduced wireless handsets for landlines for quite some time and their price continued to drop. There are still some bad cordless phones out there but our top 10 rounded up only the most appreciated models. 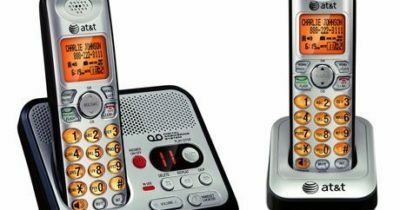 Here are the top 10 best cordless phones in 2019 reviews. Motorola’s DECT 6.0 K703B is a mid-range kit that comes with a lot of extras. The full package includes one docking station with an answering machine and a large speaker and two additional docks with their respective cordless phone for a total of three units connected to the same landline. The model has a 3 number speed-dial memory and a 15 minute answering machine. It also comes with a 3 tone equalizer and backlit display for all units. 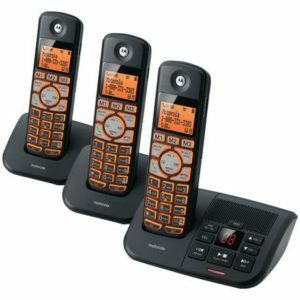 The AT&T CL80111 DECT 6.0 is an affordable option for the ones that need just one cordless handset for their landline. It has a simple design with an answering machine function and a backlit display. The model support caller ID and can store the last 10 numbers dialed. Like most other models it has ringer control, a built-in rechargeable battery and a simple charging dock. The model uses standard DECT 6.0 technology and comes in black and silver. 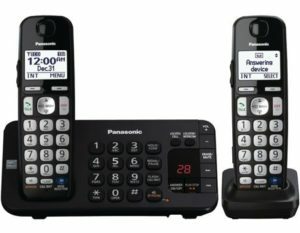 Panasonic KX-TGD210N is a great budget option. It is an affordable handset that comes with a charging dock with a speakerphone. 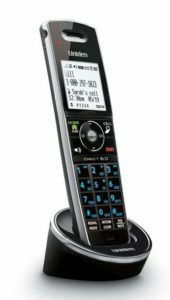 The cordless handset comes with a backlit display and an intercom function. It uses a high capacity rechargeable battery and can be expanded with 5 more handsets. The model uses the standard DECT 6.0 technology and Eco mode that saves power then the handset is close to the dock. The Uniden DCX320 is a luxurious piece of technology. It is one of the slimmest models on the market making it not only visually pleasing but also comfortable to use. The model comes with a large backlit display and an Eco mode that saves battery life. It comes with a small dock that also charges the phone and it includes a speakerphone function. The model uses DECT 6.0 technology that offers superior clarity and excellent wireless range. 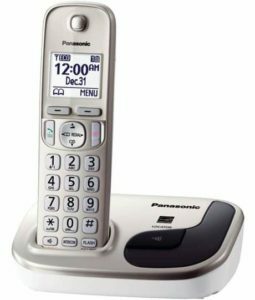 Panasonic KX-TGE242B is a great option for the ones that want something more than just a cordless phone. 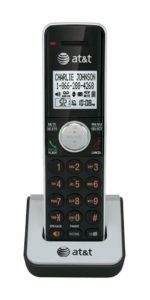 The model comes with a large docking charger that has a built-in answering machine and speakerphone with a full size keyboard dialer. It includes two cordless handsets but more can be added for a maximum of 6 total handsets. The model uses a digital answering system and uses the DECT 6.0 technology that provides crystal clear voice quality. 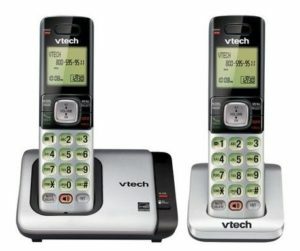 The VTech CS6719-2 is one of the most affordable sets available on the market. It comes with two cordless handsets and two docking stations. The larger dock comes with an answering machine. Both handsets come with a backlit display and keyboard and use high capacity internal rechargeable batteries. The model can be expanded by adding another 3 handsets for a maximum of 5 units connected to the same landline. Panasonic KX-TGE234B is a great pick that offers excellent value for the money. It is a full kit that includes four cordless handsets each with its own charging dock. Two more can be added for a total of 6. Its main docking unit includes a digital answering machine and a speaker phone. All handsets come with large keys and backlit displays. The model comes with tone equalizer and an Eco mode that saves battery power. 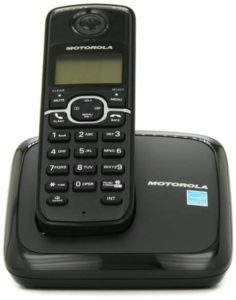 The Motorola L601M is a simple and straight forward cordless phone that comes with a reasonable price tag. The model includes a simple handset with a backlit display and large keys and a compact charging dock. It has 10 built-in ringtones and can store 30 names and numbers. Like most other models it uses DECT 6.0 technology that enables superior voice quality. The kit can be expanded by adding additional handset up to a maximum of 5 units. 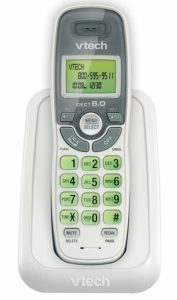 VTech CS6114 is a great option for the ones that have a limited budget yet need a reliable cordless phone. The model uses DECT 6.0 technology and comes with a handset with a large capacity battery and a backlit display. It supports called ID and call waiting and can store up to 30 names and numbers in its internal memory. The model can be mounted on a wall and offers superior voice quality. 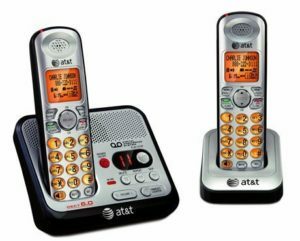 AT&T EL52200 comes as a two piece set that includes two handsets, a small charging dock and a large stand that includes a speakerphone and an answering machine. The handsets have large capacity batteries and backlit displays. Voice quality is ensured by the use of DECT 6.0 technology while its internal memory can store calls, messages, missed calls and can stores the last 50 calls. The model is fairly affordable and comes in silver and black. When it comes to technology most cordless phones use DECT 6.0 as it offers reliable voice quality. Asides from that the main differences between models are the quality of build and additional features. Some models have larger internal memory that can store more names and numbers while others can store more voicemail messages. 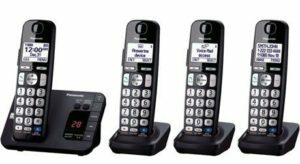 Our list rounded up cordless phones from all categories and all price ranges to make it convenient to find a suitable model.